BP in South Africa today announced a R105-million investment over the next six years in a unique youth development programme in support of government’s socio-economic empowerment aspirations. The investment will see more than 900 gifted grade 10, 11 and 12 learners from rural schools in Gauteng, Limpopo and Mpumalanga participate in a specially designed programme to bridge the gap between high school and university, and to create a pipeline of exceptionally talented professionals to take the country forward. The Targeting Talent Programme provides holistic talent development and aims to counter possible negative influences such as a lack of rigorous curriculum, poorly trained teachers and the absence of successful role models in rural communities. It provides the missing elements that assist learners to aspire to, prepare for, and obtain university enrollment. The programme has achieved an incredible success rate to date. Past learners who participated during 2010 and 2011 include Ngoanapedi Mmadikgetho Komane who was named last year’s top national matriculant. Of the 199 learners who participated along with her, 192 successfully matriculated, almost all of them are currently studying at tertiary institutions. Thandi Orleyn, BP Chairperson says BP is delighted to be part of this programme which has proved to be exceptional in every way. “Having been a sponsor of the project since its inception in 2010, we have been consistently impressed by its results, which is why we have undertaken to make the initiative BP South Africa’s flagship corporate social responsibility venture for the next decade. The programme is a clear demonstration on BP’s part to actively contribute to the country’s national growth and economic development,” says Orleyn. 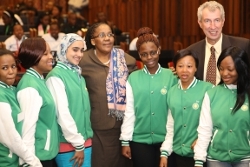 During a special ceremony to announce BP’s ongoing support of the programme attended by the Minister of Energy, Dipuo Peters and top academics at Wits University, a number of the students were singled out for honour as top performers. Dr Loyiso Nongxa, former Vice-Chancellor and Principal of Wits University and custodian of the Targeting Talent programme, described the students as tenacious in their education pursuits and applauded them for their commitment to succeed against all odds. “These students are among the first in their families to attend university and obtain a degree – something which will change their lives forever. Through BP’s continuous support these learners are much more ready emotionally and academically for what lies ahead at university and have been given all the tools they need in order to reach their full potential,” said Dr Nongxa. Of the learners from the pilot Wits TTP Programme who matriculated last year, 127 are currently enrolled at various tertiary institutions pursuing their first year of studies – 29% in Science, 27% in Commerce, Law and Management and 24% in Engineering and Built Environment qualifications, 16% in the Health Sciences and 4% in Humanities. The Minister of Energy, Dipuo Peters applauded BP’s commitment to the project and said it was a step in the right direction to bring about sustainable and meaningful transformation in the liquid fuels industry. “We expect that corporate South Africa plays a major role in the transformation agenda, and this initiative is an instructive example of how businesses can drive a concerted effort to develop, nurture and sustain black executive talent, targeting especially the youth,” says Peters. BP is one of the world’s largest energy companies and has been operating in Africa for over 100 years. BP SA focuses on refining and the marketing of fuels and lubricants in Southern Africa. It processes crude oil at the SAPREF refinery and manufactures lubricants at an oil blending plant located in the city of Durban. In addition to a national network of over 500 service stations, BP SA operates nine depots and three coastal installations and the largest rail gantry in Africa located in Pretoria. BP’s cutting-edge Fuels Technology Centre in Johannesburg further boosts the company’s ability to provide its world class Ultimate fuels in the region. It innovative convenience outlets provide a unique offering through BP Express, Fresh, Wild Bean Café and Pick ‘n Pay Express brands. BP’s pioneering transformation activities in the region over the past decade include the first of its kind empowerment initiative in 2001 and the formation of Masana in 2005, a joint venture between BP, the Mineworkers Investment Company and WBD Investment Holdings. BP’s social investments support development programmes that create a meaningful and sustainable impact across several categories especially in the areas of socio-economic and rural development as well as education and skills development.